Are you an artist, a photographer, a painter, a craftsman? Do you want to show your works to a wider audience and attract more clients? 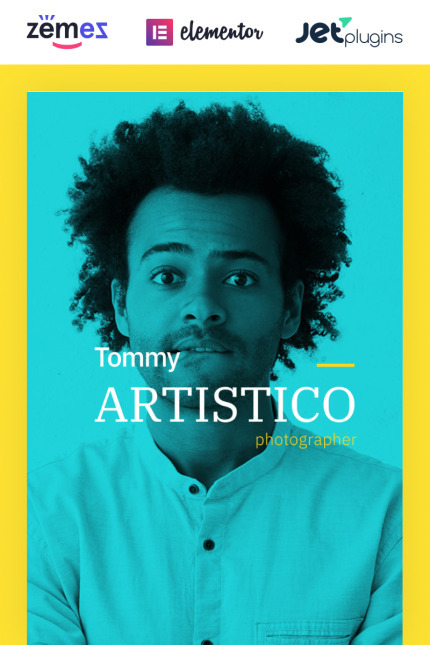 Tommy Artistico is a great option for demonstrating your services in a professional way. Create a modern, extraordinary site with Photographer Gallery WordPress theme, which is equipped with a stylish appearance and a multifunctionality. There is a great Jet plugins set for Elementor Page builder. JetMenu plugin will help to create a fully responsive mega menu with drop-down sections and enrich them with interesting content. You will be able to fill the content with dynamic JetBlog widgets, which will be customized without any coding knowledge & skills, using loads of available style settings. It will be available to organize the content into stylish tabs and accordion blocks, change their layouts and adjust different style settings to them with JetTabs plugin. Liven up your site using JetTricks plugin, which will allow adding animation effects and visual tricks on the pages in some clicks. You will be able to use varied JetElements widgets creating different kinds of content, adding useful elements and customizing them according to your vision. Tommy Artistico will help you to attract more fans of your art!